Nigella Lawson’s cookbook, Kitchen, has this delicious chocolate banana muffin recipe that my boys go absolutely ga-ga for. And I go crazy for these muffins because they contain bananas, which for some reason my kids won’t eat lately unless they’re disguised in some sort of oohey-gooey baked good. But as much as I love Nigella’s muffin recipe, I always feel that they’re missing something. Even though they contain lots of cocoa powder, it’s just not enough chocolate. I need more. 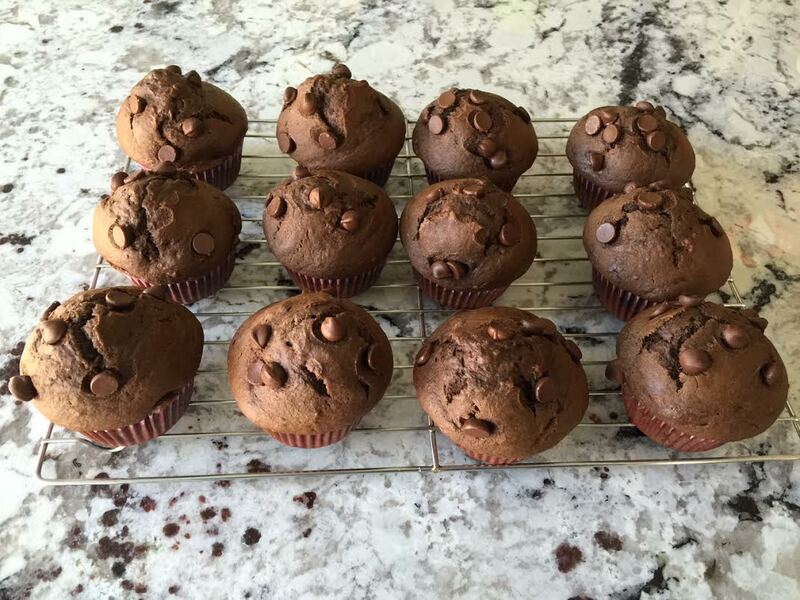 So when we make her muffins, we add about a cup (or more if you’d like) of semi-sweet chocolate chips to the batter to give them that added bit of chocolate zing that we’re always craving. Try them with a cup of tea……you’ll be hooked from the very first bite. And because they contain bananas, they must be healthy…..right?!! Using a mixer, mash up the bananas until fairly smooth. Then add the eggs, oil, and brown sugar and beat the mixture well. In a separate bowl, mix together the flour, cocoa, and baking soda and then add the dry ingredients to the wet ingredients. In a small bowl, sprinkle a very small amount of flour over the chocolate chips and toss around to evenly coat them in flour. Fold the chocolate chips into the batter. Spoon the batter evenly into 12 muffin cases. Bake at 350F until the muffins are dark, rounded, and bounce back when you poke them (about 20-25 minutes).